When your car is stolen and abandoned, how will find it or get it back? Without this unique plan, you may never see your car again. Can you afford to lose several thousand dollars? When your car is stolen for a "joy ride" and then abandoned miles away or in another town, the police may never find your car. With a $50.00 reward decal on the windows and a toll free number to call, most people will call to tell us where your car is located. Without this unique recovery plan, it may take months or more for the police to locate your car on the street or in a parking lot. finding and getting your car back. When placed on the inside of the windows of your vehicle(s), they work! 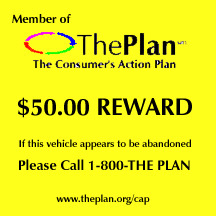 When your car is stolen, you must report it to the authorities and then call The Plan in order for us to pay the reward. We will pay the finder a $50.00 Reward. 3 day's pay later on." The SVRP is placed inside your two rear windows for people to see. This is what your decal look like. a refund of the purchase price.